‘Love – something that you hate so much’ those were her exact words! I was baffled and I questioned myself do I really hate this stupid four letter word LOVE which equates to other crucial four letter word – LIFE, for a lot of people on this planet? I am not really sure about it and this blog post has perhaps given me an opportunity to introspect. “There are two overrated things in this world Matthews. This is a dialogue by my protagonist Nazaqat. Her words definitely reflect my opinion about love. I don’t hate it. It’s overrated. To be more precise, the conventional and blind model of love is overrated. If someone has a very practical approach towards love and relationship, it certainly deserves applause. Let’s focus on a typical situation that might be happening in this world with two random person right at this point of time. A boy and a girl. Boy sees a girl; he falls for her beauty, her charm, her attitude and maybe everything about her. She is goddess. She is perfect. He wants her. Girl sees a boy and falls for his chiseled face, muscular body, and calm nature. He is popular. He is the best. She wants him. They talk sometimes, become friends, hang out a little (mostly with group of mutual friends) and secretly find out if both are single. And then, comes the proposal. I have fallen in love for you! I love you. Three most magical but overrated words in history. So, they are in love. We have established it right? Well, only after this ordeal is complete and when they have confessed their love for each other, the actual dating starts. Dating where they hang out alone, have romantic dinner, movies and get intimate – both physically and emotionally. Now, that’s the real stuff! Now is the time they will know how compatible they two are! Now is the time they will realize if they are truly made for each other or not. But they have it only after they have taken their vows and admitted that they are madly in love with each other and will do anything to be together. Problem starts to crop in dating itself. He is giving attention to other girls too. She is always late. He hits on her friend. She is rude. And on and on! And dating is just the beginning! Next step is moving in together! People who have shared rooms will have a fair clue how tough it is to manage living with someone without fighting over trivial issues! What if he doesn’t flush the toilet properly? Oh, you didn’t talk about it the whole night when your phone bills were skyrocketing? Well princess, SURPISE! Be ready to teach your boy friend about flushing the toilet! And what if she wants you to see Balika Vadhu with her? Didn’t she tell that ‘colors’ is the only channel which will air in her house? Well boss, SURPRISE AGAIN! And this is just one thing! Any small habit of someone can be irritating and the worst part it, the irritation keeps on getting multiplied and your patience keeps on getting divided and the Mahabharata starts! Is it on colors? NO IT’S IN YOUR OWN DAMN HOUSE YOU MORON! And all the vows of love and promises to wither together converts to who-said-what and who-did-what. Digging graves would be an understatement to what follows. BUT, they are in love. So, what usually happens is – people commit they love each other and then make attempts to fall in love. Moreover, young generation has been so fascinated by the idea of love that they want to fall in love because it’s cool! It’s so cool to fancy that bubbly girl or that tall guy who just got his pubic hair! Everyone in Bollywood falls in love and it will be a sin to forget Disney here! Every teenager is falling in love! Let’s be a part of wagon and fall in love! 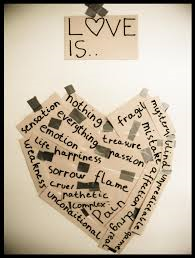 What is love? That thing on Disney! Or maybe that thing between Kajol and Shahrukh! Conclusion? People are in hurry to fall in love that they confuse it with infatuation and affection. It take years to fall in love. To understand the person. To enjoy the angle inside them and to make peace with their daemons. To happily accept that person with the set of imperfections they have. Because those imperfections define them. Those Imperfections are a part of them and you have to love those too. And it consumes a lot of time for that to happen. Crossing mountains doesn’t prove your love. Managing to live together and sharing true happiness does. So don’t be in a hurry to fall in love or you will be a victim of conventional and overrated love which has plagued our society. Practical and matured love might be your thing but that demand patience. Love at first sight is a concept of probability, so don’t count on it! If you really want to count on something, be it the fact that you are beautiful and someone will fall for what you are, not what you can be. That two people will come together and learn to live together and then fall in love, not the opposite. A beautiful post and the valued honestly What is love.TC. Kudos! I agree with everything you have written, love your writing style. I want to say that you have done an AMAZING job in Time's Lost Atlas.